Police service dogs (K9) are considered an essential asset in today's law enforcement environment. Since the introduction of service dogs into law enforcement in 1907, these dogs have repeatedly shown their value as a cost-effective locating tool. They assist in deterring criminal activity, in the apprehension of dangerous subjects, and with detection of illegal drugs. K9s generally support all the various law enforcement functions of the Oshkosh Police Department. In addition to drug detection capability, police dogs have also shown their use in having a psychological effect on criminals; in protecting the handler and other officers; and as a favorable asset in police public relations. The K9 teams are often seen doing demonstrations at community events or attending church and school functions. They are also working hard to keep the Oshkosh schools safe and free of drugs. 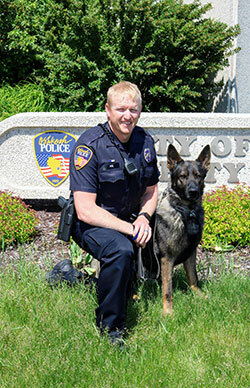 The Oshkosh Police Department has two K9 Unit teams consisting of Officer Brad Fox and K9 Odin and Officer Clinton Fettig and K9 Lando. The breeding of German Shepherds in Germany is highly regulated in Germany and only the finest of dogs are selected to be K9s because of the extreme demands required of a Police K9. German Shepherd Odin arrived from Germany and became part of the OPD K9 Unit in early September 2017. Officer Fox and K9 Odin trained together as a team through K9 Services located in New Mexico. They are currently working 3rd shift Patrol. German Shepherd Lando arrived from Germany and became part of the OPD K9 Unit in March 2018. Officer Fettig and K9 Lando also trained together as a team through K9 Services located in New Mexico. They are currently working 2nd shift Patrol. The teams are certified in narcotics detection for marijuana, crack/cocaine, meth, ecstasy and heroin. They are also certified in building searches, area searches, article/evidence searches, tracking and protection. Oshkosh Police Department K9 Kare Fund.